We've brightened the page design a little and tried to maintain the same design over all pages. 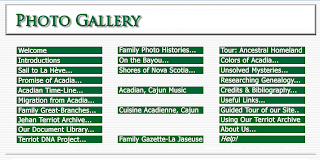 But in addition to that, we have re-organized our Photo Histories section to try to focus on our Great-Branches. Please visit that section and consider picking a few photos that presents your Great-Branch. Please describe each photo so that our visitors will be able to appreciate and understand each photo. Here, we encourage not only our Delegates but any member of our Great-Branches to submit historic photos of the families in their Great-Branch. We have reserved this section for photos of each of our Great-Branches that might be of interest to today's generations. Let's make this collection one that our children and grandchildren may learn about their grandparents, great-grandparents and other ancestors. Our hope is that you will send us some of your photos of someone in your Great-Branch to share with the rest of the family, especially photos of members of the 11th generation or earlier. If you do not have the photo in electronic form, send us an e-mail to get our postal address and you can then mail a copy of the photo to us. Do not send the original.